The dialer supports Smart dialing just fine (looking up both names and phone numbers). 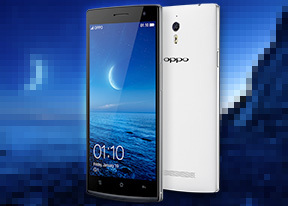 The Oppo Find 7 offers a Holiday mode, in which only notifications and calls from a whitelist of users will get through, while the rest will get muted or rejected. Note that we did the test with various Wave MaxxAudio sound presets - the results varied between Good and Very Good. The main difference came from the Pink Noise test, which is a clear testament to the fact that the Wave sound presets are quite capable of tuning how music sounds through the loudspeaker. The Oppo Find 7 loudspeaker is really loud no matter what preset you are using, but you can squeeze out even more courtesy of the Wave effects. The Find 7 offers a great Swype-enabled keyboard with big keys and they become even bigger when you switch to landscape mode - the wide screen is remarkably comfortable for two-thumb typing. There is an option to change the individual key height in both portrait and landscape, which isn't found that often. Themes are available too. You can also have split or mini keyboard layouts.